So I was modifying jeg’s training module to implement the SoZ party Editor in it. The idea was to call it from using a placeable, just like in the SoZ campaign. So I made a new campaign just for jeg’s training module, set the options to allow party creation (max size 4), and made the placeable that calls the party editor GUI. Too bad there’s a big problem, when the UI is called the party limit is someway reduced to 0, and I can’t add any character to party. In fact, not even the main character is recognized in the list. What could be going wrong now? I took a look at various scripts inside the SoZ campaign itself and there seems to be nothing wrong. Any help would be appreciated. I would say check out my module for a working example, but it’s not yet currently available - unless you really need it. 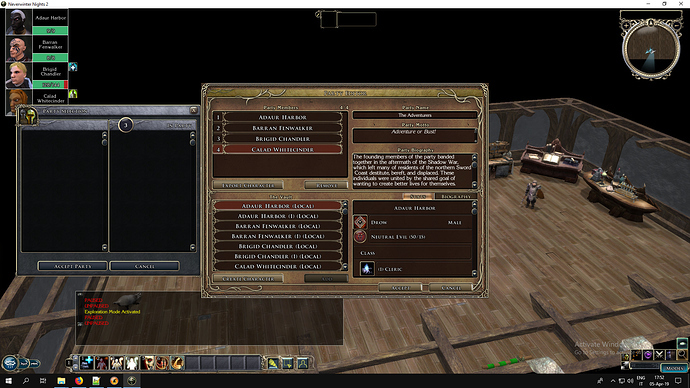 // ASSUMES 1 PLAYER PLUS 5 COMPANIONS/CREATED PCS. IF THERE ARE 2 PLAYERS, THEN ONLY 4 OF THESE 6 CAN BE ADDED, ETC. // I.E. FOR EVERY ADDED PLAYER, THE NUMBER OF COMPS/CREATED PCS THAT CAN BE ADDED DROPS BY 1. // THIS IS A RESTRICTION I HAVE ADDED IN ALB_COMP_ADD SCRIPT AS OPPOSED TO ROSTER LIMIT SET HERE. // HERE I USE THIS FIGURE TO SET PARTY SIZE MORE THAN ACTUAL ROSTER LIMITS AS IT INCLUDES PLAYERS MAIN PCS IN MY CHECKS. // I DONT KNOW WHAT WOULD HAPPEN IF MORE THAN SIX PLAYERS JOINED IN THE GAME - DONT HAVE ENOUGH COMPUTERS TO CHECK. 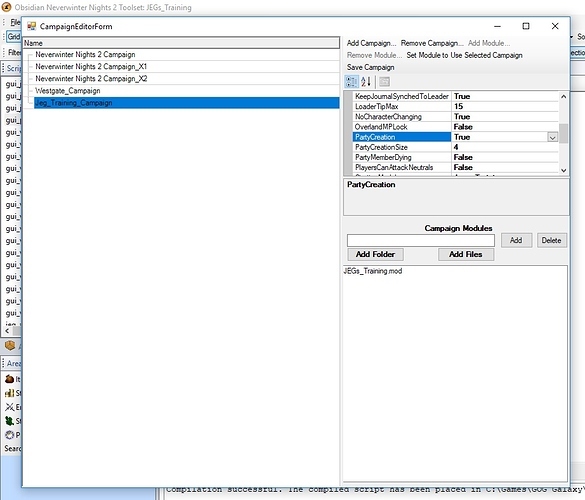 The problem may be in the campaign editor itself, so you have to use the script workaround suggested above. So I remember back in the day when I used the Campaign Editor feature in the toolset to modify the campaigns. Now I’m using it again right now to edit the party size limits in all four campaigns among other minor things, but every time I press Save Campaign and close the toolset, next time I open it back up, it ignored my edits and reverted back. Does anybody know how to stop that? SetRosterNPCPartyLimit is not fixing it (I was calling it already, but with 4 instead of 6, that said I changed it to 6 and it still doesnt fix the problem), and besides, it’s set to 3 by default regardless of its call, so even in that case, I would at least see 3 slots in the party generation, but it’s just not what is being called by the GUI to allow those character slots to be available at all. I know that the Setroster NPC party limit is triggering, because I can see the number changed from 4 to 6 in the Party Roster submenu. OK - Is the XML you are using the default one or was that also modified in some way? If it is a modified version, try calling the OC version as a test. Is there any way you can send a basic mod/xml code for me to test/look at my end? i.e. Single room area with basic campaign/mod setup and bare files to start. 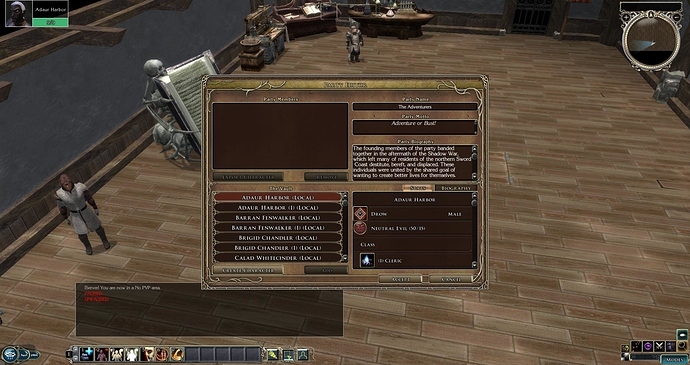 Can you provide more details on how exactly you open the party creation GUI or what scripts you are using for this? If you have everything else setup with the campaign and the XML is good then this should work fine. OK. Looking at the way the GUI is presenting itself, my “guess” would have been that the XML was not quite right in some way. Even a possible supporting XML like fontsize or family types. One other thought … try keeping the campaign name simple … Just try “TEST” as a new campaign. I have a vague recollection I hit a similar problem when I tried renaming my campaign once. Actually, I notice you DO have some edited XMLs that may be interfering with the party GUI. Remove all other XML supporting files and retry. You may find that one of the other XMLs has altered a default font size and it no longer fits the GUI you are trying to use. I had that happen to me once (but in a different GUI)! No, the other xml is not interfering, I can tell now because I fixed it. So it was not saved properly at all. Now it works, and it works even without the SetRosterNPClimit function. We should have gone back to basics eh. Glad it’s sorted for you though! You could have saved yourself some time by just downloading my Deck of Trumps item. Google is your friend.